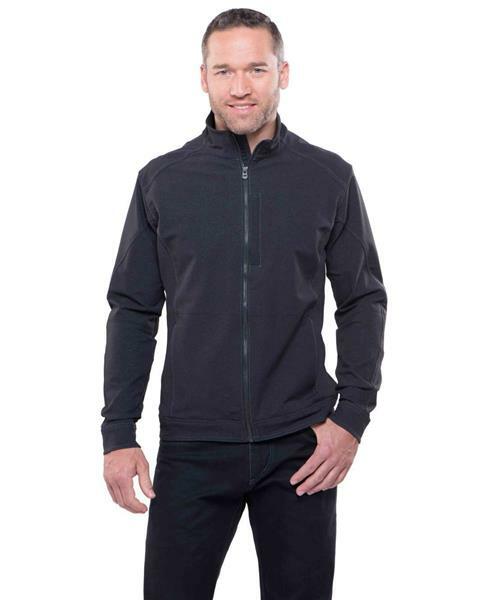 The KÜHL Klash Jacket™ is a durable, abrasion-resistant softshell with a unique two-tone weave and a solid yoke overlay. The fabric is treated with a DWR finish for water resistance. KÜHL's 5-panel articulated sleeves provide better range of motion. The jacket's front inside is lined for a clean finish and easy on/off. Tested to more than 10K pulls, the YKK Metaluxe™ center front zipper looks like metal at one-third the weight. Two zippered hand pockets and a chest pocket provide secure storage. With easy care, packability, and wrinkle resistance, the Klash jacket is the perfect multi-purpose, lightweight jacket for travel and adventure.